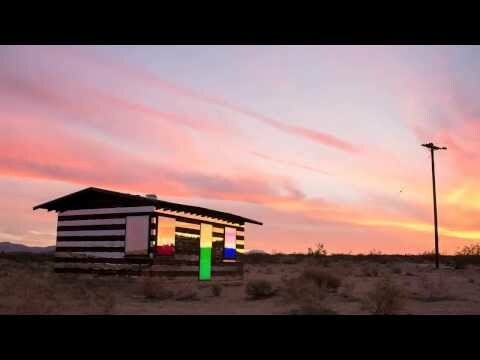 In the barren deserts of southern California, visual artist Phillip K. Smith III has built a house of glass. Rather, he took an old, dilapidated desert cabin and revamped it using mirrors. Now, the once defunct building has a new life as a piece of visual art, right in the middle of Joshua Tree National Park. Take a look at the pictures below to see what a one of a kind house this one really is. This Isolated Desert Structure Is The Brainchild Of Artist Phillip K. Smith III. He Ripped Off Alternating Strips Of Burnt Out Wood And Attached Mirrors In Their Place. When Viewing From Certain Angles, The Cabin Itself Becomes Nearly Completely Camouflaged, Fooling The Eye With A Complex Set Of Reflections And Refractions. This Video From Mr. Smith III Shows More About The Creation Of His Magnificent House Of Glass. Is That A Pile Of Massive Boulders? Oh, Wait, Have A Close Look!